Thursday, Oct. 4, 7:00 - 8:00 p.m. Expert mariner and marine conservationist Jonathan White will give a presentation of his recent book, TIDES: The Science and Spirit of the Ocean at the Port Townsend Public Library, October 4th, starting at 7pm. This event is co-sponsored by the Northwest Straits Foundation, the Port Townsend Maritime Center, and the Jefferson County Clemente Course in the Humanities. Expert mariner and marine conservationist Jonathan White’s love for the sea is lifelong. He grew up diving, sailing and fishing on the beaches of Southern California, has logged more than one hundred thousand miles sailing on the Pacific and Atlantic, and has surfed all over the world. In the 1980s, he founded the Resource Institute, a nonprofit educational organization for which he hosted a renowned seminar series aboard Crusader, a 65-foot wooden schooner that sailed the Pacific Northwest. Crusader’s odysseys nearly ended in 1990 when the boat ran aground and was nearly destroyed on a large tide in Alaska’s Kalinin Bay. Shaken and intrigued by his underestimation of tides and their power, White set off on a quest across the globe to under the history, science, and majesty of one of or planet’s most remarkable phenomena. In TIDES, writer, sailor and surfer Jonathan White takes readers across the globe to discover the science and spirit of ocean tides. In the Arctic, he shimmies under the ice with an Inuit elder to hunt for mussels in the dark cavities left behind at low tide; in China, he races the Silver Dragon, a twenty-five foot tidal bore that crashes eighty miles up the Qiantang River; in France, he interviews the monks that live in the tide-wrapped monastery of Mont St. Michel; in Chile and Scotland, he investigates the growth of tidal power generation; and in Panama and Venice, he delves into how the threat of sea level rise is changing human culture – the very old and very new. A year after publication, Jonathan White’s TIDES has earned prestigious literary accolades, winning the 2018 Pacific Northwest Booksellers Association Award for Best Book. Jonathan shared this honor with Sherman Alexie’s, You Don’t Have to Say You Love Me, and Corinna Luyken’s, The Book of Mistakes. TIDES was short-listed for the Eric Hoffer Grand Prize, the largest international book award for small, academic and independent presses. 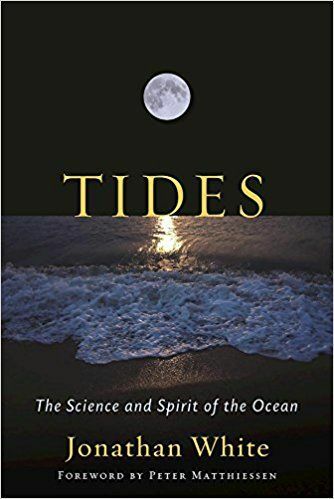 TIDES has received several other awards including: the National Outdoor Book Award in the Natural History Literature category; the IBPA Benjamin Franklin Award (Silver); Nautilus Book Award (Silver); 2018 winner of the Next Generation Indie Book Awards in the category of science and nature; and Publishing Professionals Network Best Book Award for Trade, Text-driven. Planning is currently underway by the BBC to produce a documentary series based on TIDES. TIDES continues to attract audiences worldwide with brisk sales, and has garnered positive reviews from the Wall Street Journal, Seattle Times, Oregonian, The Surfer’s Journal, San Diego Union Tribune, Publisher’s Weekly, Tampa News, and dozens of others. Jonathan was also interviewed on many TV and radio programs, including NPR’s Living on Earth, Michael Krazny’s The Forum (out of San Francisco), The Leonard Lopate show in NYC, and The Bill Bradley Show. Jonathan is currently working on an article for Wooden Boat Magazine about the restoration of the Western Flyer, the boat John Steinbeck and Ed Ricketts sailed to Baja in 1939. The Log of the Sea of Cortez, published in 1941, memorialized the trip. The Western Flyer was considered lost until it was discovered on the bottom of the Swinomish River a few years ago. Jonathan’s first book, Talking on the Water: Conversations about Nature and Creativity, is a collection of interviews exploring our relationship with nature and features Gretel Ehrlich, David Brower, Ursula K. Le Guin, Gary Snyder, Peter Matthiessen, and others. White has written for the Christian Science Monitor, The Sun, Orion, Surfer’s Journal, and other publications. He holds an MFA in creative nonfiction and lives with his wife and son on a small island in Washington State. Sponsored by Friends of the Port Townsend Library.